Greeting, geek fans! I’m trying to rally to what passes for normal for me, and figured a vintage cartoon post was just the ticket. It’s a quaint cartoon from 1966. There’s some good fifty year innocence here. And some good old fashioned 60’s racism, but that may be my modern mentality. I’ll allow you to decide for yourselves. Let the geeks begin! We open in the Batfink cave. Not the Batcave, that’s DC’s property. 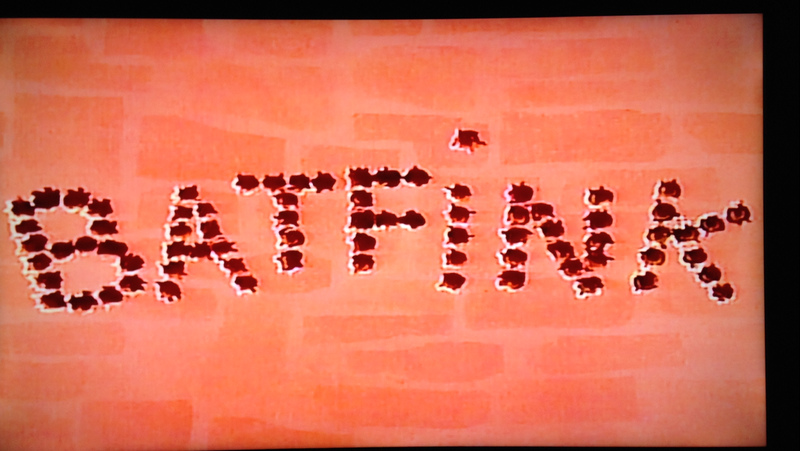 Batfink is not Batman. Though he’s a fun parody of Batman, there’s a legal distinction. Just to be clear. 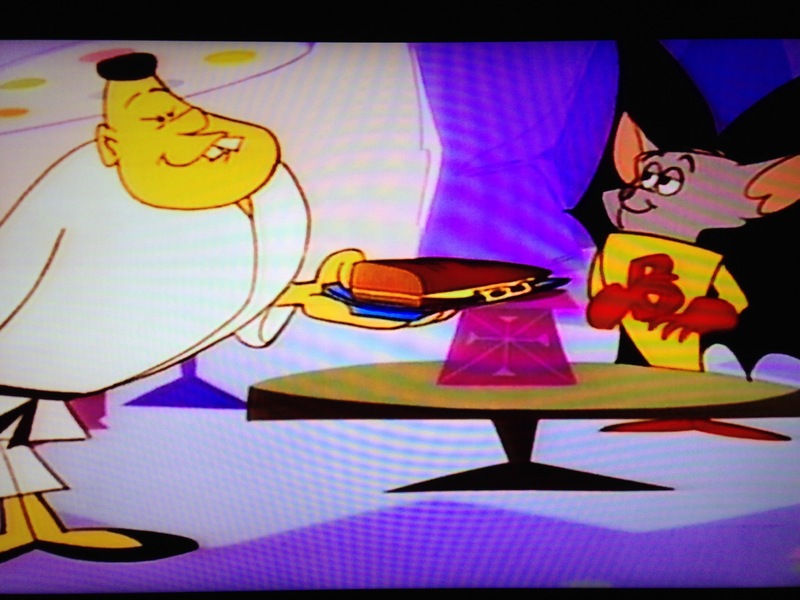 His assistant/partner, Karate is carrying a hero sandwich since Batfink is a hero. Batfink says he couldn’t possibly eat it all, so Karate gives it a chop with his hand, and asks if he’d like half. Alright, elephant in the room, Karate is yellow, with buck teeth, squinty eyes, and is wearing a Gi with a black belt. All he needs is a sign that reads “Asian stereotype”. Batfink on the other hand is a grey bat in a yellow suit with red shoes & gloves, as well as black wings. 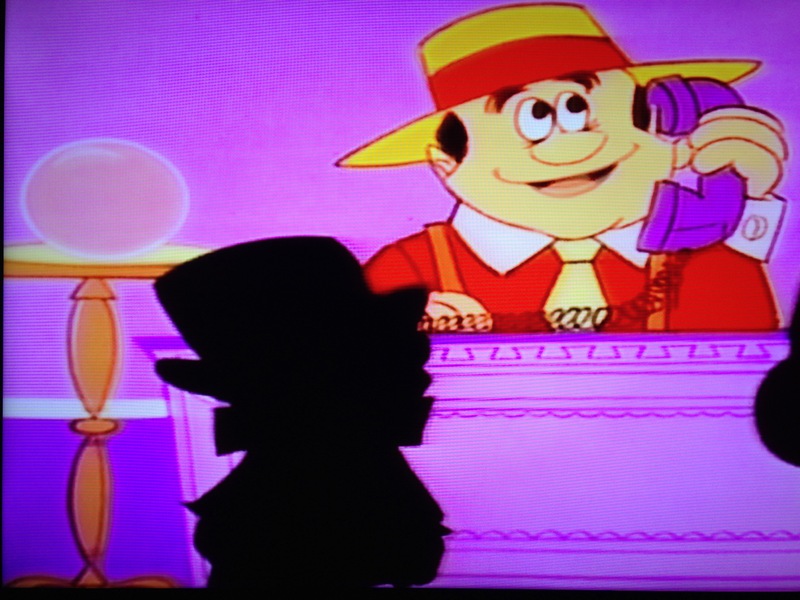 The hotlines goes off, and the chief appears on the bat-shaped tv. 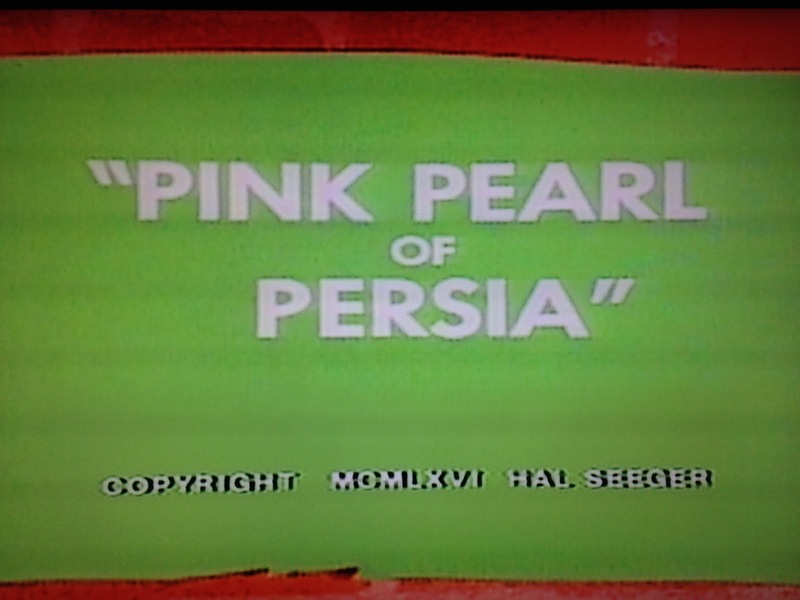 The priceless pink pearl of Persia has been pilfered. I do love me some alliteration. 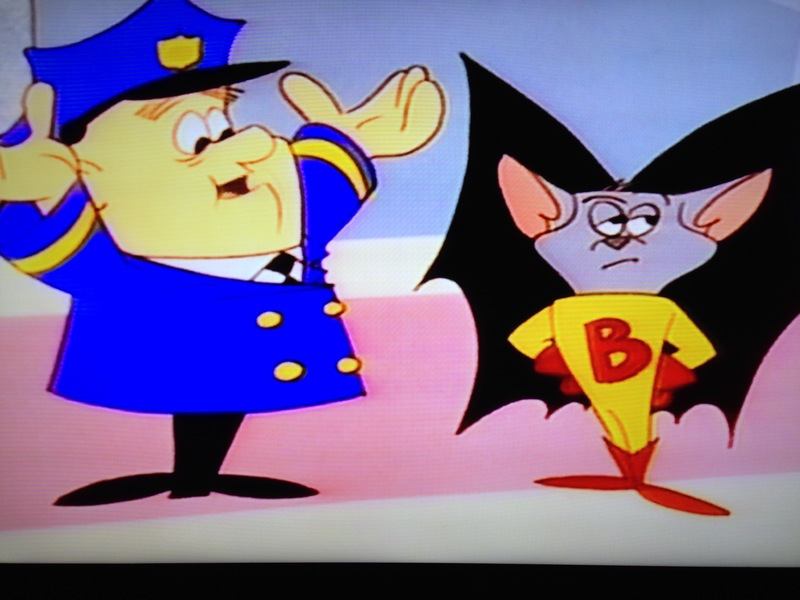 Batfink says he’ll be there before the chief can say “Jack Robinson”. The chief says he has a hard enough time saying the priceless pink pearl of Persia. 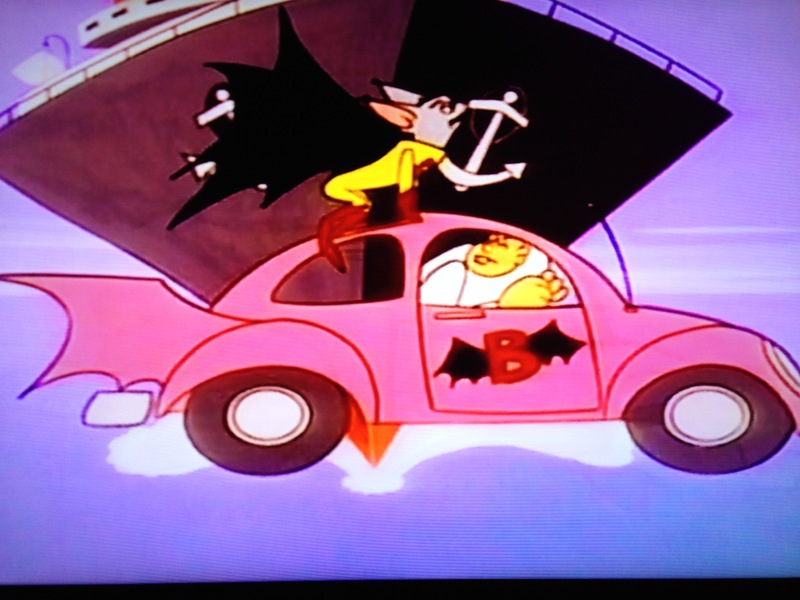 Batfink and Karate get in the Batillac, which is actually a pink beetle, and head towards the crime scene. See, not at all like Batman. This bat wears bright colors, rides in a pink car, and isn’t broody all the time. I say rides in the car cause Batfink is too important to drive himself. Better have the Asian sidekick do it. I’m sure there’s an Asian driver joke in there somewhere, but let’s press on. The drawbridge is going up, and rather than being a responsible hero and waiting, he needs to get to the crime scene now, cause more stuff may disappear. Well, you tell me. Karate is ordered to try and make the gap, and fails. Before they can crash into the water, Batfink flaps his might metal wings, and carries the car, with Karate inside it, to the other side of the bridge. 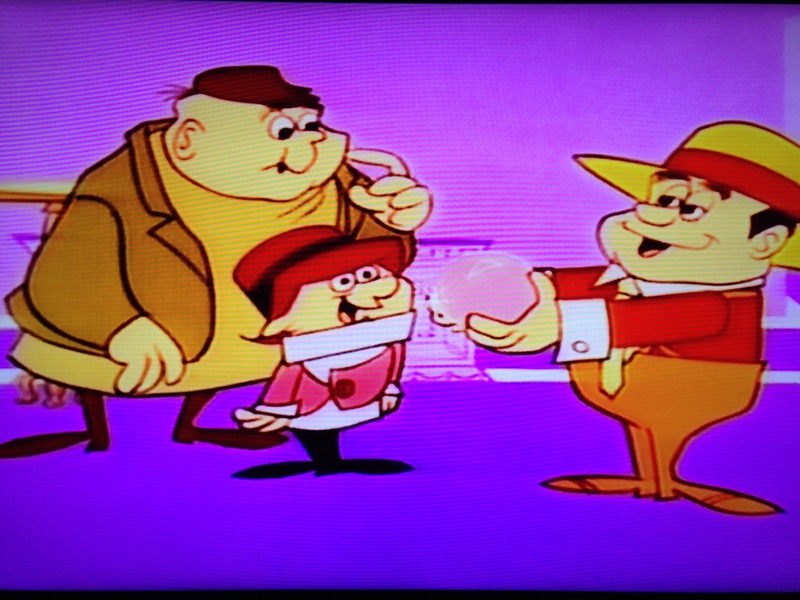 At the museum, the chief shows Batfink the case where the priceless pearl had been, and says there’s positively no clues. Karate says not to be so sure, as Batfink has his supersonic sonar radar. Cause bats use echolocation, get it? Batfink squeaks and two “BEEP” words leave his mouth, explore the case, and the museum looking for clues. 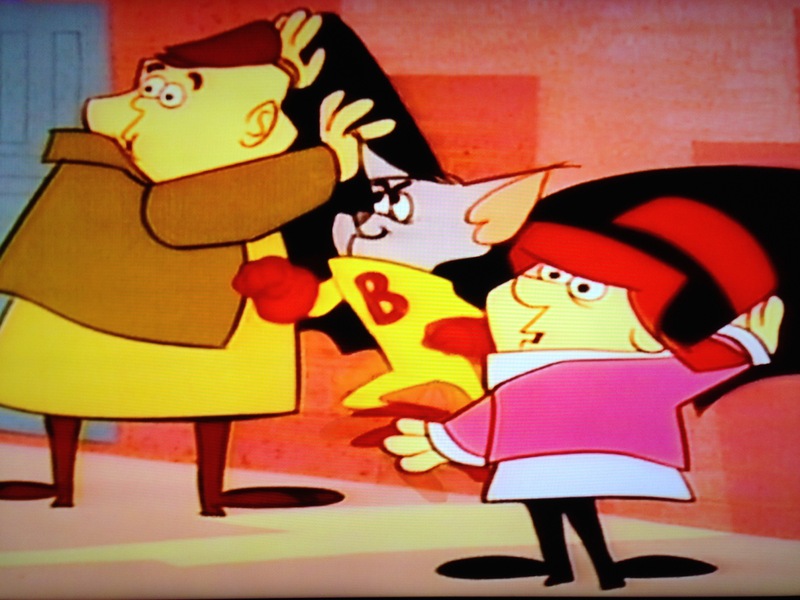 Then they return to Batfink, beep the info back to him and disappear. Just go with it. Chief asks if he found anything. 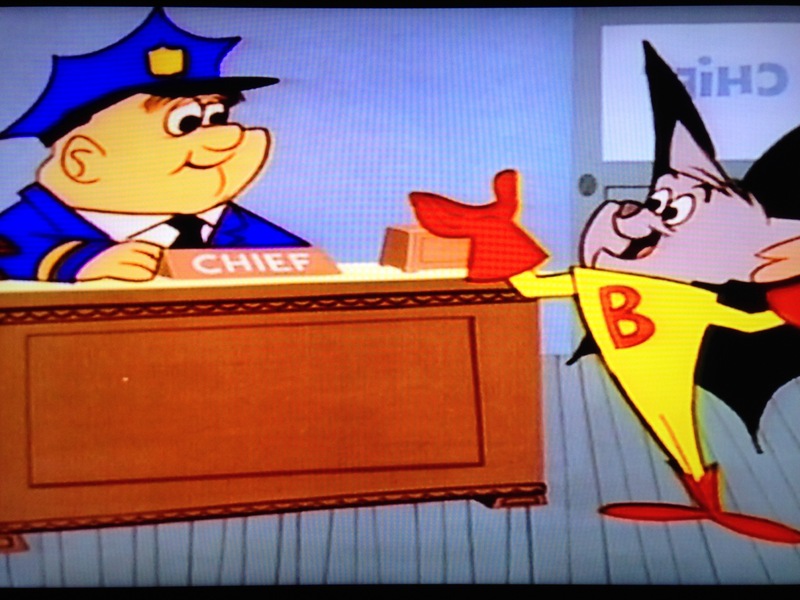 Batfink points out the chief’s badge on the floor. Anything else? Yes, he found a really big clue. The chief says he doesn’t know how, as they searched the museum top to bottom. Batfink says he found it in the middle. *Snap! Side note, he’s got such sass on his face it’s perfect. Batfink says he knows who did it. The chief asks if he’ll bring them in. Batfink says no. Cut to a tv reporter stating that no reason was given for Batfink’s behavior, and that the police think he’s now on the side of crime. The entire nation is branding him a traitor. Geez, just cause he didn’t give you a clue that you and your staff were too stupid to discover on your own? These are as bad as the Gotham police in Hi Diddle Riddle. But this is totally not Batman. Upon seeing the broadcast, Karate is so upset that he splits the tv in half, cause that’s a reasonable reaction. Bad guy hideout. The mobsters see the paper stating that Batfink is a traitor. Since he’s now on their side, he should be cut in on their deal. Um, cause honor among thieves? Batfink didn’t help steal, but sure. Boss then picks up the phone and calls Batfink. *Record scratch Hold up, the mob boss just called Batfink. Picked up the phone, and called him. At home. In the Fink cave. I feel like you’re not getting the significance of this. It’s one thing for the cops to be able to call the hero, but how did the mob get his number? Are there, “for a flapping good time call Batfink at-” signs in the local restrooms? At any rate, they tell him since he’s been good to them, to come to the Surfside Motel, bungalow six. Maybe they met on Grindr once. Batfink says he’ll be there before they can say “Jack Robinson”. The mob boss says he has a hard enough time saying the priceless pink pearl of Persia. I sense a running gag. Karate takes Batfink to the hotel, as I’m sure he has before. Batfink tells him to stay in the car, again, as I’m sure he has before. Batfink knocks, they ask who it is, and he tells them. They tell him to come in. Repeat – They tell him to come in. They have a stolen priceless pearl, and they don’t even lock the damn door. That is some sixties bad guy for ya. Batfink enters, and they tell him they were just about to split the pearl. I’m no gemist, but wouldn’t damaging the pearl completely destroy its value, and make it worthless? Just throwing that out there. The little guy says Batfink can have the end cut. He says he’ll take it all, and return it to the museum. They call him a double-crosser, and start shooting their guns. Except the little guy who is using a goddam sling shot. Seriously. Batfink hides behind his wing, and says it’s a shield of steel. Karate hears the gunfire and assumes the fink is in trouble. He chops the door, and it falls on Batfink, causing the pearl to roll back to the bad guys. Karate calls his hand stupid, and says it’s going to be punished by spending the rest of the day in his pocket. Wow. As the mob celebrates having the pearl back, Batfink literally pulls the rug out from under them. To the Batmobile, er, Batillac. As Batfink and Karate take off, the mob gets in their convertible and chases them. The little guy who can barely see over the wheel is driving, cause sight gag. Batfink extends a wing, and causes a street lamp to shake. The bowl falls off, and lands on the little guy’s head. Not in a knock him out way, in a mock space helmet kinda way. It causes the to swerve into a billboard, but they rally and head after the Batillac again. Karate says he’ll turn down the ally to ditch them, totally missing the Dead End sign, cause Asian driver. They crash, and Karate apologizes, but at least he still has the pearl. That is, until the mob take it out of his hand. The cronies hold Batfink against a wall by his wings. Arms free. He could punch them at any time. They’re literally in striking distance. Mob boss says he may have wings of steel, but now he’s gonna have a belly full of lead. If I were one of the toadies, I’d be praying the boss was a good shot, otherwise, awkward. Batfink says his wings may be pinned, but he still has use of his supersonic sonar radar. Ugh! Don’t show off your bat powers! Punch the bad guys! Bite their necks! C’mon, man! Sigh, fine. BEEP flies towards the mob boss, and the sound of it disorients him, and makes him cover his ears. Then, and only then does Batfink punch one of the cronies. He then tosses the little guy into his friends. Guess he had a plan all along. Back at police HQ, Batfink explains how when he said he had a clue, and knew who did it, he was bluffing. It was his way of getting the crooks to come to him. Yeah, cause it’s not like they didn’t already have your number or anything, or that you saw them online for bat play at the motel. Whatevs. The chief says at least they’re done with the pink pearl of Persia. Then the phone rings. Oh no! Someone just stole the sacred Siamese star sapphire of Sicily. I’m not even gonna break down all the things wrong with that one. That cartoon ends, and we’re left on that “cliffhanger” of a joke. Tune in tomorrow, same Fink time, same Fink channel. Totally different! Don’t sue me. Until next time, stay geeky, and keep gabbing. This entry was posted in Cartoons and tagged batfink, batfink and karate, batillac, my wings are a shield of steel, retrotoons, supersonic sonar radar. Bookmark the permalink.